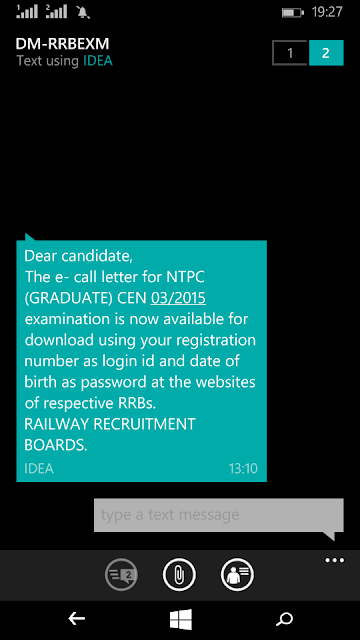 Railway Recruitment Boards has officially released their guidelines for RRB NTPC CBT exam. Negative Marking: 1/3 rd fo every incorrect answer. 1. 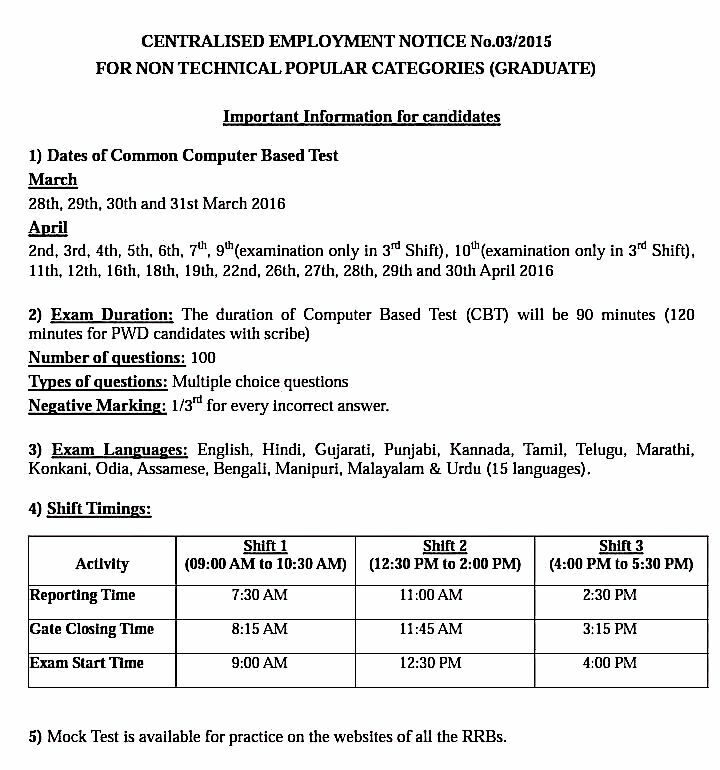 Candidates should report at the center of the examination well in advance of the reporting time indicated on the e-Call Letter to complete activities such as verification of the candidate, capture of biometric(LTI and photo), collection of documents, announcement of instructions and logging in etc. 2. Candidates to note the following timings. Normally, CBT/Examination will be held in 3 shifts in a day (See Shift Details above). The duration of CBT will be 90 minutes ( 120 minutes for PWD with scribe) for 100 questions. 3. No candidate will be allowed inside the test center after gate closing time for the date and shift indicated in the e-Call Letter. 4. Candidates are advised to locate their test centre and its accessibility at least a day before the test so that they can reach the centre on time on the day of the test. 5. The e-Call Letter is to be submitted for verification at the time of the test. must be presented failing which he/she will not be permitted in the exam. 6. Please affixx Passport size Colour Photograph – same as that was uploaded at the time of online application - in the space provided on the RRB portion of the e-Call Letter. 7. For appearing in the ONLINE examination, candidates as well as scribe Must affix one colour photograph each (of size 3.5 cm x 3.5 cm), as was uploaded at the time of online application. 8. Candidates who have opted for scribe and want to change their scribe can do so by submitting the requisite information at the examination centre on the day of exam. For this purpose, candidates to fill up details in ‘Change of Scribe’ form provided on the e-Call Letter of scribe. 10. Mobile phones or any other electronic gadgets such as watches, blue tooth enabled devices, calculators are NOT ALLOWED inside the Test Centre. examination hall and RRB/Assessment service providers are not responsible for its loss. Only e-Call Letter, Photo ID card, pen/pencil will be allowed inside the test hall. 11. The candidate can view the question paper in any of the fifteen languages including the opted language and answer the questions. Candidates availing assistance of scribe will have to communicate with the scribe only in the language opted by them in the online application. 12. There will be negative marking for wrong answers. For every wrong answer, 1/3rd mark will be deducted. 14. Friends and relatives accompanying the candidate will not be allowed inside the test centre. 15. Candidate should write his/her name and Roll Number on the Rough sheet(s) provided for rough work. The Rough sheet(s) will have to be returned after the test. 17. The e-Call Letter is provisional, subject to the condition that the candidate has fulfilled all the eligibility conditions like academic qualification, category, PWD status etc. as mentioned in his/her online application which is subject to verification in the consecutive stages of the selection process. 18. Special instructions, if any, given by the Invigilator should be followed strictly. 19. Change of date/centre of examination is not permitted under any circumstances. 20. Mere issue of e-Call Letter does not confer any right to be eligible for the post. The candidature is purely provisional and is liable to be cancelled at any stage of recruitment or thereafter, in case any inconsistency is noticed. 21. 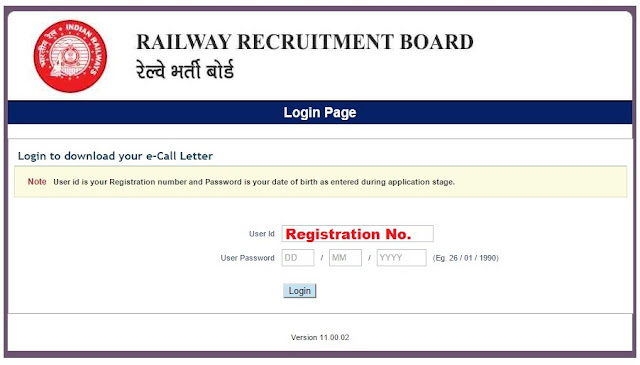 RRB reserves the right to order re-examination for any or all the candidates. 22. Decision of the RRB in all the matters will be final and binding on the candidates.